I’m sure a lot of people right now are implementing their New Years Resolutions. Maybe they want to lose weight, go to they gym or be grateful. But what about for your professional life or your business – are you thinking about that? You may have already heard of the four quadrants of work, or the ‘Eisenhower Matrix’ but it’s worth revisiting. 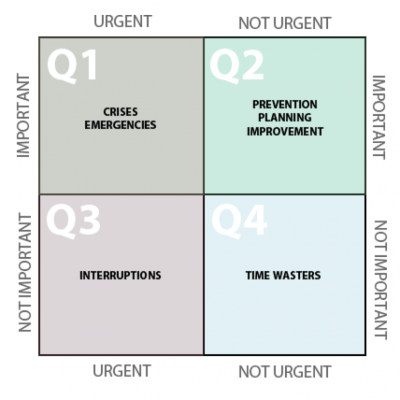 What is urgent for you and what isn’t? What’s important, and what is not? Hopefully you’re not spending too much time in Q4 (not important and not urgent), but I bet you spend a lot of time in Q1 and Q3. I know I have! A confession. In the past few months I’ve felt very reactive. I spend most of my time doing business development and writing proposals (great – usually means we’re making money!). What I was doing was firmly in the quadrants of Urgent, I need to keep my CRM ticking over after all and proposals are our final steps towards generating revenue. But I was feeling very reactive and was barely thinking about next week let alone next year! So I’ve spent the past couple of weeks firmly entrenched in Q2, that is Important and Not Urgent. As the CEO of Capytech, it’s up to me to determine where we want to be in the upcoming years. Only by dedicating time to this task can I start to shape that – call it strategic thinking if you will. What were the results of this? Well I know that we want to see the majority of our growth in the eLearning space. This is where we add the most value, and have amazing products. I want to generate leads into companies that either sell training or conduct their own. This is an obvious fit for us as interactive and online training is still quite immature here in the UAE. So spend some time in zone 2, I think you’ll find it provides clarity. To read more about this subjects, take a look here and here.